Diving in Phuket, Thailand is perfect for a combination with traveling and sight seeing or even climbing. The green forest vegetation extending down to limestone cliffs and pure white beaches lapped by warm, turquoise waters, the coasts of Thailand are a tropical paradise with spectacular waterfalls and coconut palms bending towards the sun. Phuket ranks as one of the world’s Top 10 dive destinations, and with good reason. The water is warm and teeming with marine life; the Andaman being one of the most diverse seas on the planet. If you are lucky you might see whale sharks and manta rays. There are literally hundreds of islands and reefs to be explored by day trips or liveaboard cruises from Phuket, and a wealth of sites providing a wide range of diving opportunities. Phuket is a great place to achieve your PADI (Professional Association of Diving Instructors) certificate. It is rated amongst the top 10 diving destinations in the world and many of the centres in the area boast years of experience. Phuket possesses an abundance of dive companies, all ready to give you accredited instruction, provide equipment for hire, and take you on day trips or extended trips to more distant dive spots. The competition this has created among dive operators means a very high standard of safety, training, quality equipment and facilities. At the same time, prices remain very reasonable.. Diving in Phuket’s clear blue waters is best from November through to May, when the calm seas and rain free days make diving here an extraordinary experience. However, monsoon winds and surface swells in the Andaman Sea during the rainy season, running from late May to October, can make remote spots inaccessible. See Phuket Weather for more information. 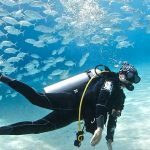 Aussie Divers Phuket is a PADI 5 Star Dive Centre and the home of professional scuba diving education, PADI courses, the best place to book your day trips or liveaboard adventures in Phuket. At Sea Bees, we use our comfortable 23m long dive boat, Excalibur 2, for day trips. 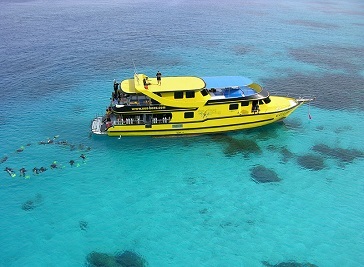 The boat was specially designed for divers and has set new standards for diving in Phuket. You can find more information about our day-tripper here..